This award-winning bourbon is inspired by the whiskey pioneered by Augustus Bulleit over 150 years ago. Its bold, spicy flavours and complexity come from a special blend of rye, corn and barley malt, along with strains of yeast, which result in treacle, nutmeg and spice notes on the palate, and a smooth finish. Bulleit Bourbon is a Kentucky straight bourbon whiskey whose high-rye content and iconic frontier inspired bottle is a favourite among bartenders and mixologists across the world. When Tom Bulleit set out to make a bourbon unlike any other, he was inspired by a recipe created by his great-great grandfather Augustus Bulleit more than 175 years ago. Crafted using pure limestone-filtered water and charred American oak barrels for all of the colour and some of the flavour, Bulleit is especially high in rye content, giving it a bold, spicy character with a distinctively smooth, clean finish. Bulleit Bourbon is a Kentucky straight bourbon whiskey whose high-rye content is a favourite among bartenders and mixologists. Bulleit was voted as the bestselling and most trending American Whiskey brand of 2016 by the Worlds 50 Best Bars A rich, oaky aroma with flavours of vanilla, spice and pepper. The distinctively spicy, dry & clean taste makes an exceptional cocktail such as Julep or Old Fashioned. 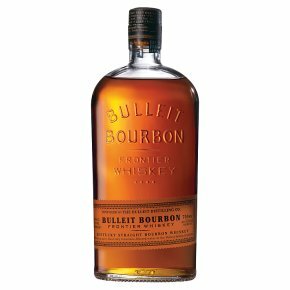 Bulleit is especially high in rye content, giving it a bold, spicy character with a distinctively smooth, clean finish. The distinct high rye content of Bulleit Bourbon provides a bolder, spicier character for the discerning drinker." Why not try a delicious Bulleit Mint Julep? Simply add some mint leaves and 10 ml sugar syrup to a highball glass. Press down on the mint leaves to extract flavour and aroma. Half fill the gladd with crushed ice and measure 50ml Bulleit Bourbon into the glass. Stir the mixture well and top up with some more crushed ice. Add a spring of mint on the top of the drink to garnish.